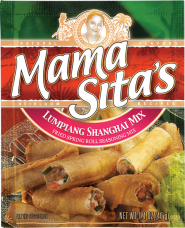 A dish made up of pork or chicken, vegetables, and Mama Sita's Lumpiang Shanghai Mix, and served with a sauce. In a bowl, combine ingredients for the filling and mix well. Scoop one tablespoon of the filling onto a spring roll wrapper, about 2 inches from the bottom. Spread mixture evenly into a form of a roll well across the wrapper and roll tightly. Seal the edges with water or egg whites. Cut into 3 pieces and dip both ends in some flour. Deep-fry over medium heat until golden brown and drain off excess oil. Serve with Mama Sita’s Sweet Chili Sauce or Mama Sita’s Sweet and Sour Sauce.